The 102-cm Far Infrared Telescope was one of the most sensitive and versatile balloon-borne instruments ever used for observations in the far-infrared region of the spectrum (40 ~ 250 µm), producing high resolution maps of large sky areas including molecular clouds, dark cloud complexes, planets, asteroids, and leading to the discovery of many new IR sources. At left can be seen a picture of it during preparations for a flight (click to enlarge). The gondola was designed and constructed by the Solar Satellite Engineering Group, of the Harvard College Observatory while the University of Arizona contributed the primary and secondary mirrors and the infrared detectors. The core of the instrument was a Cassegrain telescope composed by a spherical primary mirror measuring 102 cm of diameter, constructed of Tenzalloy (an aluminum alloy) along with a 18-cm secondary mirror, made of Pyrex, and figured to match the primary mirror. The Cassegrain focus occured behind the primary mirror where the infrared beam was reflected by a dichroic beam splitter that passed visible light. A second beam splitter directed half the optical light onto an N-slit mask at a second focal plane. Light passing through the mask was focused onto a photomultiplier tube. The secondary mirror was mounted by means of a central bolt to a solenoid-driven chopper mechanism further mounted on a commandable-focus drive, which made the mirror to oscillate in the azimuthal direction. The whole secondary system was supported by four sheet-metal spiders to the external support ring and then through conventional tubular trusses to the central telescope ring. The telescope was mounted in a rectangular aluminum-frame gondola 5.1 m high and 3.4 X 2.9 m wide. Heavy structural elements were used throughout the central portion of the gondola to maintain the integrity of the telescope tube, the elevation and azimuth axes, and the payload electronics. The instrument was stabilized and pointed by means of positional servo controls on the elevation and azimuth axes. The entire gondola moved in azimuth, but the telescope motion in the elevation direction was with respect to the gondola frame. The driving element for each axis was a DC torque motor mounted directly on the axis without gearing. In elevation, the reaction mass was the main frame of the suspended gondola. 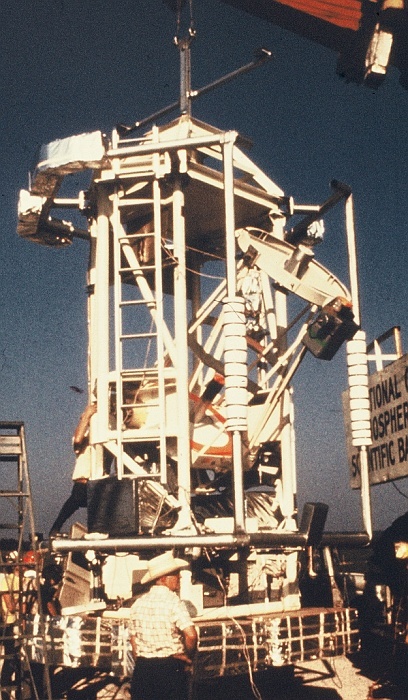 Reaction forces for the azimuth position control were provided by a large reaction wheel mounted on the gondola center line below the telescope. 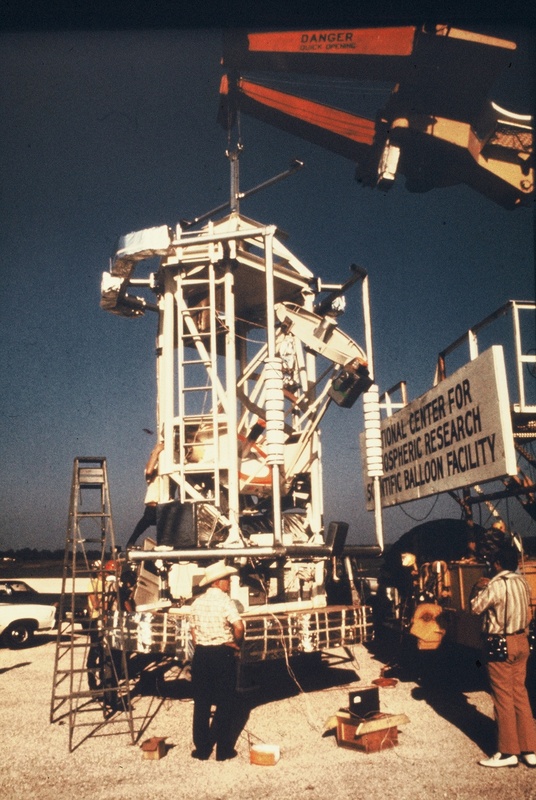 Also to control the reaction-wheel speed and to isolate the gondola from balloon rotations the system used a "momentum dump" device. The main power for the payload was supplied by silver zinc batteries pack. The entire system weighted approximately 1814 kg. Positioning the telescope optical line of sight was accomplished in two modes: first, an acquisition mode, determined with respect to the horizontal component of the earth's magnetic field in azimuth and with respect to the local vertical in elevation; and second, an inertial mode, determined by a two-axis gyroscope system mounted on the telescope tube, that gave stability in inertial space. For the acquisition mode, a null magnetometer was mounted on a table and servo-driven in azimuth so as to remain fixed to local magnetic north. The N-slit photometer, was used also for fine-position determination of the telescope. As Stars transited across the three branches of the N mask, this information was telemetered to the ground, indicating with high precision the elevation and azimuth of the optical object with respect to the star field during scanning activities. For postflight pointing verification a 35-mm-sequence camera was mounted on the telescope, with a field of view of about 15º. It took images of stars and recorded a projected reticle pattern, along with data indicating frame number, time, and status of the payload. It could be commanded from the ground, or automatically triggered during scanning. In the event of failure of one or more major systems in the primary operation of the telescope pointing, -something that occured in the first flights- a simple backup control system was available to be activated by tone commands. This system served two functions: automatic stow and crude pointing control of the telescope in azimuth and elevation. The infrared detection system used on the focal plane of the instrument in the firsts flights consisted of four gallium-doped germanium bolometers, cooled to 1.8 degrees Kelvin in a liquid helium dewar vented to ambient atmospheric pressure. The cooled optics, consisted of a sandwich of 0.86 mm crystalline quartz and 1 mm calcium flouride. During the entire duration of the program another five instruments have been flown at the focal plane of the telescope, broadening the scope of research and increasing the amount of institutions that benefited of the use of the platform. These included a Single-beam, four-color infrared photometer developed by the University of Palermo, Italy, a Ge:Ga photoconductor broadband photometer developed by the Smithsonian Institution and the Naval Research Laboratory, a Scanning Fabry-Perot Interferometer developed by the Service d'Aeronomie, C.N.R.S., France, FIRS-1 a Far-infrared Michelson interferometer developed by the Smithsonian Astrophysical Observatory and a far-infrared a Fabry-Perot interferometer and grating spectrometer developed by the University College London, England. Althought no serious incidents occured during the two decades that the program lasted at some point the gondola, associated electronics and wiring started to be too unreliable in later stages. Funds were requested from NASA for a complete refurbishment of the instrument, but the upgraded never materialized and rather than risk a failure, after nineteen flights the program was terminated in 1989 and the platform was put in storage. In 1996 the Smithsonian Astrophysical Observatory transfered the gondola to the National Air and Space Museum in Washington, D.C. where several components of it are in display. As inheritance, the innovative design of the gondola was taken by three different scientific groups whom further developed the concept in brand new instruments for astronomical and astrophysical research. This was the sixth flight of the instrument. The objective was to perform high resolution mapping and photometry of celestial sources at far infrared (40-250 microns) wavelengths. The flight was very successful from the scientific point of view, generating some of the highest resolution maps ever obtained at far infrared wavelengths, with the highest sensitivity available at the time. During 8 hours at float, 17 sources were investigated, including the Galactic Center region, the infrared Star IRC-l02l6, Uranus, the H-II Regions M8, M20, M16, M17, W3l, W33, the Rho Ophiucus dark cloud, two H-II regions at -50 degrees declination and two galaxies, M82 and Mk23l. The effective temperature of Uranus Astrophysical Journal, vol. 209, Oct. 15, 1976, pt. 1, p. 633-637.